If you’ve ever watched those sleek boats glide over the water and wondered what it’d be like to be the one racing along then come out to the “National Learn to Row” clinic at the Dee Campbell Boathouse in Old Town (Alexandria, VA) this Saturday, June 7. They’ll teach you the basics on the erg and even get you out on the water. It’s a very DC thing to do ~ Washington DC was recently ranked “Fittest City in the US” by the American College of Sports Medicine. I’m guessing that fitness includes Northern Virginia seeing as we’re so close. Click here for additional information on Learn To Row! We are frequent visitors to Regent’s Park, many times as a short cut to a friend’s flat in St Johns Woods. 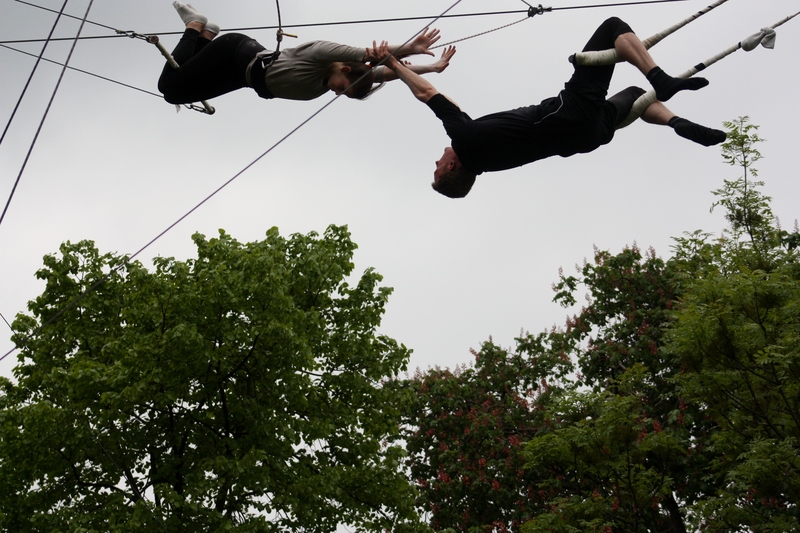 A couple of weeks ago, we came across Gorilla Circus ~ Flying Trapeze School. They are located at the corner of Outer Circle Rd and Avenue Rd on the north side of the Regents Park. The closest tube station is St Johns Wood (Jubilee Line). 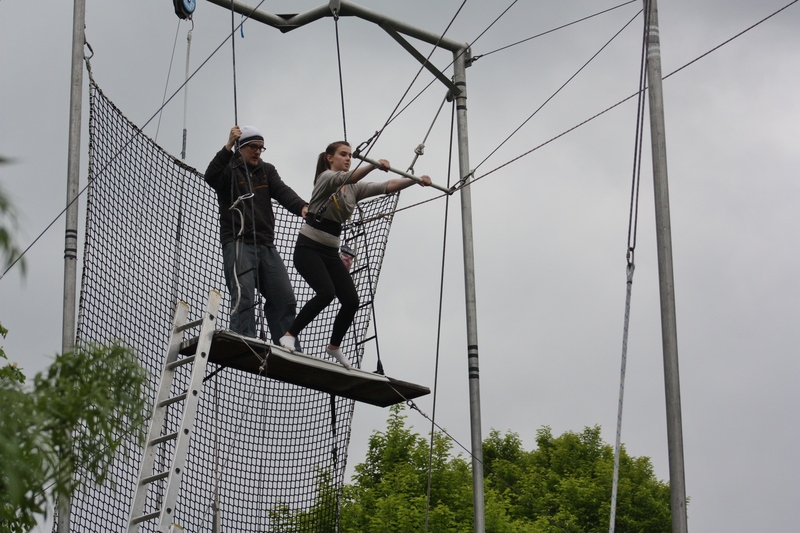 After seeing the Flying Trapeze School, I was interested in going but hadn’t looked into it any further. Coincidentally, my friend said she went to the school and loved it. She asked if I wanted to go with her and she made the arrangements for a class which was yesterday. The maximum number of students is 10 and we had 9 in our class. 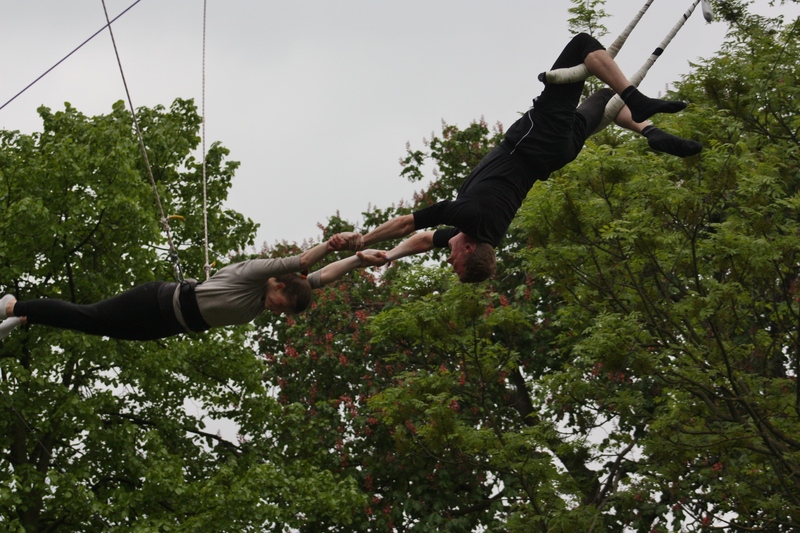 They told us we would have a warm-up, practice on the lower bar and then we would go on the flying trapeze. First, we did basic warm up which included jumping jacks, stretching side to side, running in place and a few balance exercises. Then everyone went over to the lower bar, they explained we would hold the bar, bring our legs up, hook our legs onto the bar and reach back. There were two people helping everyone up on the lower bar so don’t be intimidated if you feel you wouldn’t be able to lift yourself onto the bar. 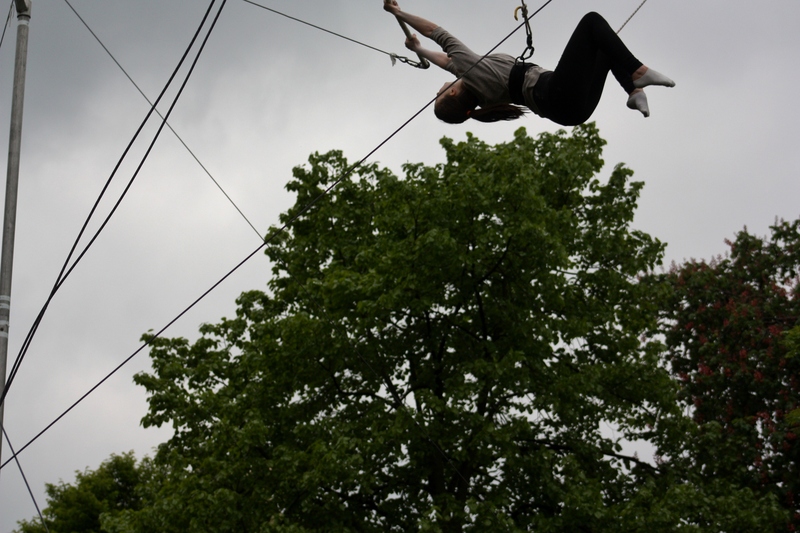 The instructors worked with you on your level of expertise so if you are more experienced, they offer more difficult “tricks.” Having never been on a trapeze, I was at the beginner level with the majority of the class. 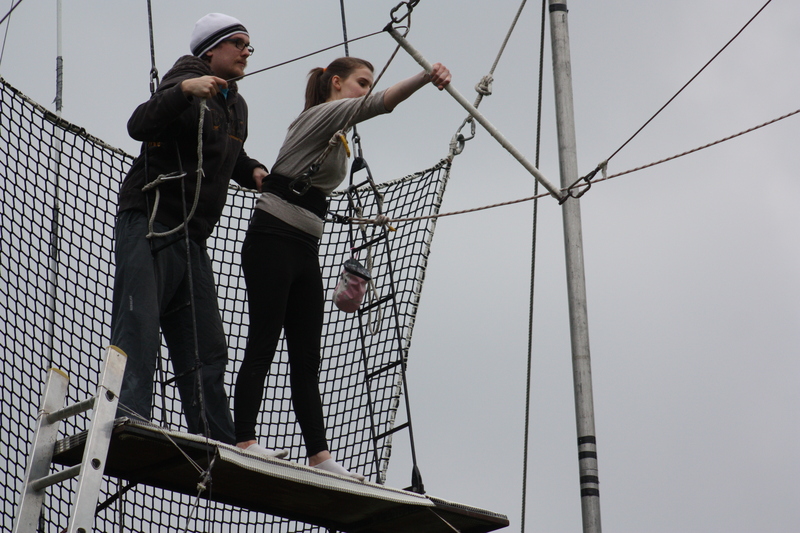 After my turn on the lower bar, they hooked a safety belt around my waist and we walked towards the ladder. It was very fast paced and I was worried I wouldn’t be able to do it but most of the people were worried too so it was reassuring. A few people wore jeans which I think made it more difficult. It’s better to wear tights/leggings. After the lower bar practice, we waited for our turn. I was nervous but concentrating on watching the other people so I could learn from them. Climbing the ladder turned out to be the scariest part of the whole thing but you’re hooked to a rope just in case. Once at the top, there’s a platform assistant who hooks you into the safety ropes and he holds onto the back of your belt so you don’t fall off the platform while reaching for the bar. The bar is heavy so reaching out to grab it is difficult because it felt like it was going to pull me right off the platform. Thankfully, the platform assistant was strong enough to hold me back. I followed the commands and “hupped” ~ I’m very happy they don’t say jump because that sounds more terrifying to me. 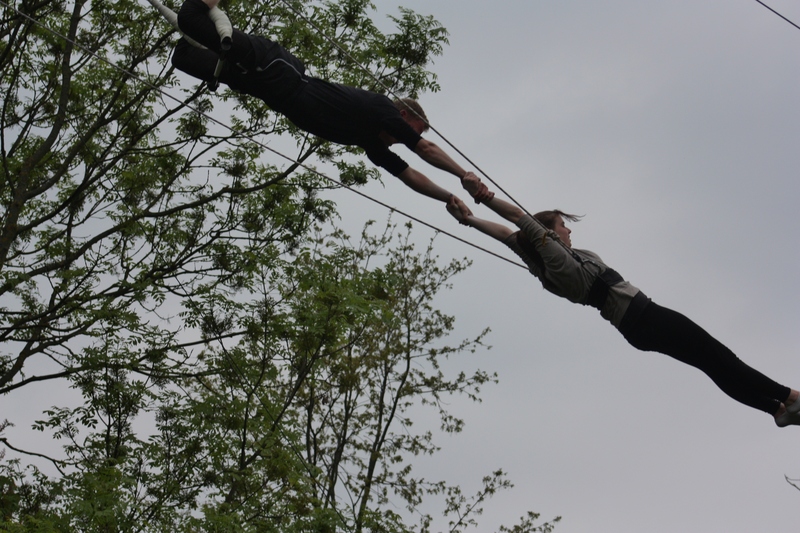 “Hup!” seemed much less scary. Time to get those knees hooked! It was thrilling and I’m happy I did it. I want to go again. It’s an interesting work-out but the instructors are all very nice and supportive. There were all different age levels in our group. The minimum age is 8 years old but no maximum age. If you don’t “get it” on your first try, there’s usually time for another attempt. I think my parents would enjoy it so I’m hoping to go again with them. 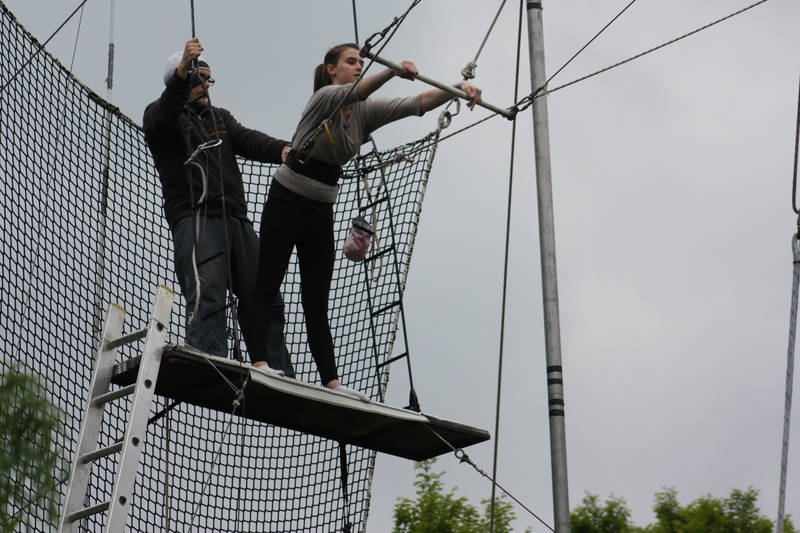 I have to admit, watching my 15-year-old be brave enough to do the Flying Trapeze has at least peaked my interest in wanting to try it. Since it seems very safe and the instructors didn’t “shame” anyone who missed the “hand off”, I might go just for the fun of flying on the bar. If you’re interested, click here for all the pertinent details and let me know how you like it.